It's official, I'm going to admit it..I've become a crazy palette hoarder these past few months. I don't know what's gotten into me, but I have acquired more palettes lately than ever before. While I have plenty that I love that aren't on this post; these are my current and most Autumnal ones with a home on my bathroom sink. NARS 'Isolde' Eyeshadow Duo : Okay, okay I know I'm cheating with the first two being duos and not full palettes, but I still think they count. This has already appeared on the blog a few times now and you probably won't stop seeing it for a while. It is seriously just the most perfect Autumnal two-set ever. A golden light shade paired with a rusty, copper shimmer. You can't really get much better than that. Tom Ford 'Moodlight' Skin Illuminating Duo* : As you can tell by the texture on these in the photo above this duo is well loved. There is something so incredible about the darker shade. It just creates this insane glow on the cheeks without being overwhelmingly shimmery/glittery. The lighter shade is also a gorgeous everyday highlight since it's not packed with glitter. The formula of these is beautiful as well and really applies very smoothly. It gives a flawless finish and doesn't enhance pores. Becca 'Ombré Rouge' Eyeshadow Palette : I seriously cannot get over this palette. 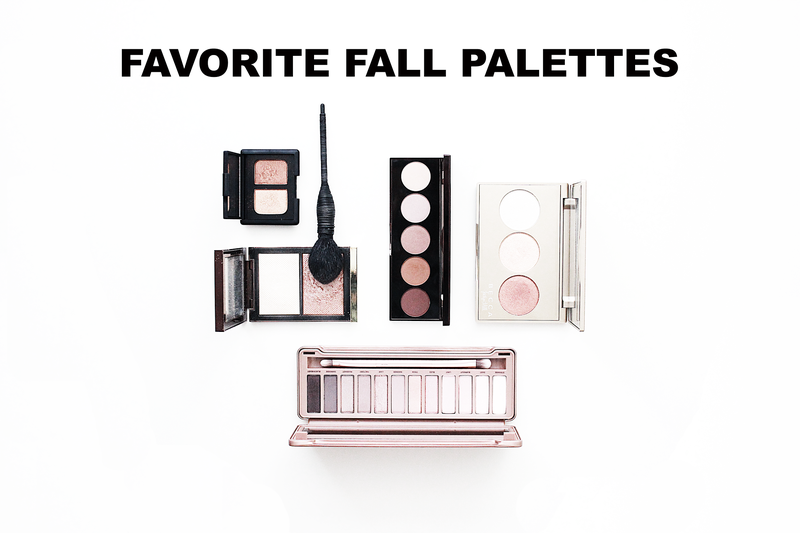 Say hello to everything you could ever want in an overall basic (warm toned) palette. Five matte/satin shades that all compliment each other perfectly. You can create really simple, neutral looks for everyday or really vamp it up and smoke it out. 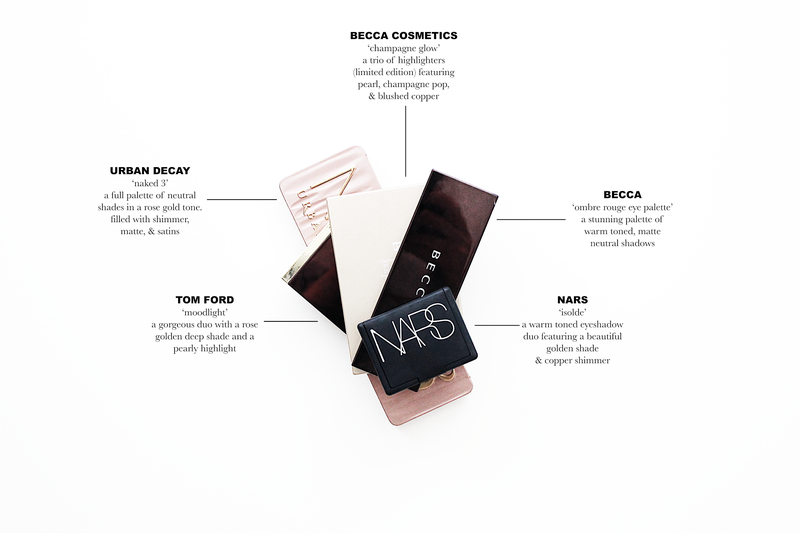 The palette is perfect for travel, or if you are just starting out and looking for a basic palette. Becca x Jaclyn Hill 'Champagne Glow' Palette : YAS. YAS. YAAAS. (That was an homage to Jaclyn Hill.) This palette is limited edition for holiday and I can't recommend it enough. It's the perfect treat for yourself or any beauty lover in your life. It consist of three limited edition shades: Pearl (a pale linen white), Champagne Pop (soft gold with peachy undertones), and Blushed Copper (warm copper/rose gold). First off I was so excited to get a second Champagne Pop since the original single shade is limited as well, but I was also blown away by the other two shades. I love mixing Pearl + Champagne Pop to create a lighter version of Champagne Pop and I love using all three on my eyes as shadows as well. *ps: I know this is sold out online, but when I was in the store over the weekend they still had some in stock! Urban Decay Naked 3* : I recently dedicated a full post to this gorgeous palette. It's filled with everything you could need for a rose/mauve eye look in the fall. It has a great range of matte, satin, shimmer, and glitter shades and can be used for just washes of color or more intense smoked out looks. In true Urban Decay form the shadows are super buttery, pigmented, and give a velvety finish that looks beautiful. What palettes are you loving at the moment? Have you picked/do you own any of the ones above? Share your favorites with me in the comments!